Limit your search results to NCBI-curated domains, which include interactive phylogenetic sequence trees, by adding the following criterion to your query at the top of the search results page: AND cdd[Database], and press the "Go" button. 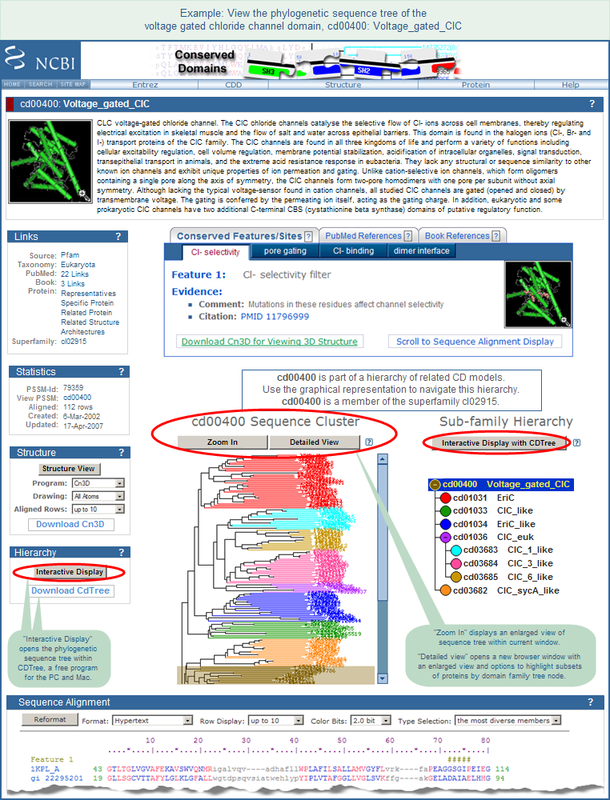 A low resolution view of the phylogenetic sequence tree is embedded in the Sequence Cluster section of the CD summary page. Press the Zoom in button to view a higher resolution tree within the current browser window, or the Detailed View button to open a new browser window, which contains the higher resolution as well as options to highlight subsets of proteins by domain family tree node. It is also possible to embed a protein query sequence in a conserved domain model's phylogenetic sequence tree.